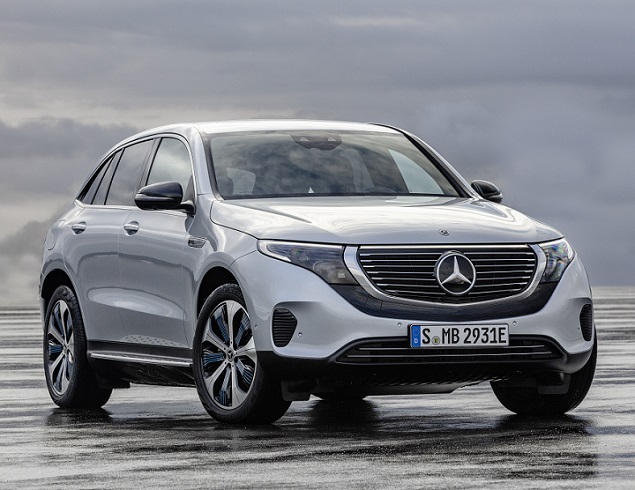 With the introduction of the 2020 Mercedes-Benz EQC, the proud German automaker officially goes electric with a new series of planned battery-powered vehicles that complements—and could ultimately replace—its current gasoline- and diesel-fueled models. A 5-passenger midsize crossover SUV, the new EQC displays the essential design themes that Mercedes-Benz will use across its expanding EQ lineup. The most notable deviation from modern Mercedes themes is the black panel on the front that mimics the look of a traditional radiator grille, and which features an LED light band running across the top of it that connects the LED running lights, and an illuminated Mercedes logo in the center. With regard to the EQC, the look resembles an evolution of the popular GLC-Class. In fact, the automaker says that in profile the EQC’s roofline splits the difference between a standard Mercedes SUV and one dubbed an SUV Coupe. Naturally, the available AMG Line styling gives it a sportier appearance. The dominant element is a pair of 12.3-inch displays perched on a shelf containing the center air vents and from which the steering wheel protrudes. The shelf is part of an MB-Tex-wrapped dashboard that appears to float in front of a wall that wraps from the driver’s door panel around to the front passenger’s door panel. Beneath the vents, a row of piano key climate controls and secondary buttons resides on a gloss black panel that waterfalls into the center console, where a touch pad resides for inputting commands for the infotainment system. Mercedes promises that the EQC will provide an exceptionally quiet interior. Leather seats in multiple hues combine with aluminum-look or natural grain wood for a luxurious look and feel. An optional ambient lighting system offers 64 different colors from which to choose. Buyers can upgrade to an Electric Art interior design line with Rose Gold cabin accents. Alternatively, the AMG Line treatment installs seating with Dinamica manufactured suede inserts and MB-Tex bolsters, stainless steel pedals, and a flat-bottom steering wheel. Full leather seating and carbon-look trim are available for the AMG Line version of the EQC. In the new Mercedes EQC, an 80-kWh lithium-ion battery powers dual electric motors, one located at each axle in order to provide all-wheel drive. The front motor is calibrated for efficiency, while the rear motor is tuned for a sporty driving character, Mercedes says. Together, these components deliver 402 horsepower and 564 lb.-ft. of torque. Multiple driving modes are available through the standard Dynamic Select system. They include Comfort, Eco, Max Range, Sport, and Individual. In Sport mode, according to Mercedes, the EQC accelerates to 60 mph in 4.9 seconds. More importantly, in Max Range mode, the estimated driving range is approximately 200 miles. Drivers can use the EQC’s steering wheel paddles to manually activate the battery recuperation system, which offers five different settings. The most aggressive recuperation setting allows for one-pedal driving as in the Chevrolet Bolt and Nissan Leaf. Alternatively, drivers can rely on Eco Assist and D Auto mode to automatically adapt recuperation to traffic conditions based on navigation data, traffic sign-recognition technology, and driver-assistance radar and camera units. When the time comes to recharge the EQC, Mercedes says it can achieve an 80% charge status in 40 minutes using a DC Fast Charger. Mercedes says that it has specifically adapted the EQC’s structure for the vehicle’s electrical components and battery pack, and has applied safety standards to the battery and all parts carrying electrical current that exceed European requirements. Should a collision occur, and depending on the severity of the crash, the high-voltage system is designed to automatically shut down. Furthermore, depending on the severity, the shut down is either reversible or non-reversible. Emergency responders can also manually shut down the system if necessary. Active Brake Assist is standard equipment for the EQC, a forward-collision warning and automatic emergency braking system with pedestrian and cyclist detection. The optional Driver Assistance package includes an enhanced version of Active Brake Assist that adds Evasive Steering Assist and Pre-Safe Plus. That latter upgrade prepares the cabin for a rear impact when the vehicle senses that one is about to occur. Active Distance Assist is an adaptive cruise control system with stop-and-go capability and new predictive speed adjustment when approaching areas known to have traffic. The predictive speed adjustment feature is specifically designed to address situations where a driver rounds a blind curve or crests a blind hill and suddenly finds traffic backed up, requiring a hard-braking exercise. Additionally, the EQC’s stop-and-go capability supplies an extended 30-second pause time before it disengages. Or, you could just steer it yourself. There’s that. Mercedes is in the process of rolling out a new MBUX infotainment system to its latest models, and in the EQC it includes unique functions specific to the company’s line of EQ models. A highlight of the system is artificial intelligence that allows the technology to learn, predict, and anticipate what the user wants to do next. Also, the new “Hey Mercedes” natural-voice-recognition system learns from the EQC’s users. Buyers can upgrade MBUX to include augmented reality technology and a Burmeister premium sound system. Three different instrumentation themes are available in the new EQC, including Modern Classic, Sport, and Electric Art. The EQC also supplies Mercedes Me Connect services, which the company claims is a signal that the automaker is moving away from pure automobile production, sales, and service and toward becoming a provider of mobility services. The company underscored that Mercedes Me Connect offers EQC owners pre-entry climate control programming for optimum comfort when getting into the SUV, optimized navigation for fastest route and shortest charging time, and directions and access to multiple charging providers as well as an integrated payment function.